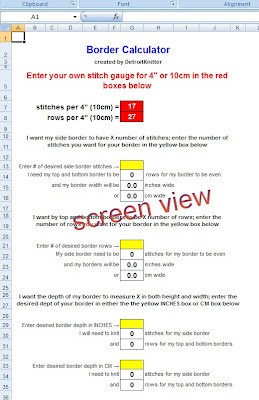 I created this quick knitting calculator to help you calculate your border width; it's a great tool for knitting borders that are even on all 4 sides. You could even use it to get the total dimensions for anything square like say a dishcloth. 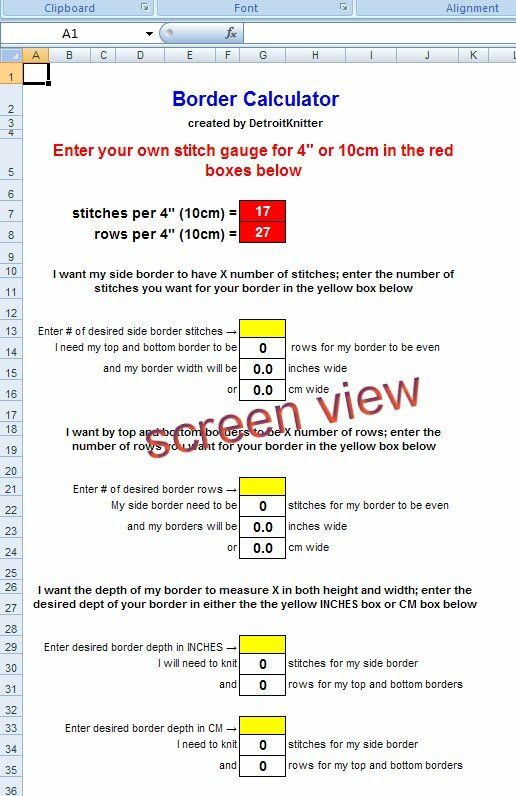 If you want it to be 9" across, just plop your stitch/row gauge in the red boxes at the top then 9 in the yellow box labeled "Enter desired border depth in inches". It says enter the "border" depth, but just enter the desired width of your square from one edge to the other. Sorry Charlie, this does not replace the need to knit a swatch! You should be able to use it right from Google Docs without downloading it or just download and keep it in your ever expanding file of knitting tools you've downloaded to your computer for fear that some day the link won't work anymore - oh, come on, I can't possibly be the only that hoards those things! :) Click on the link below to check it out. As the disclaimer states: use at your own risk. Mathematically it's correct, but you're the one that has to determine your correct gauge for stitches and rows.